According to Gerald McDermott, reporting in Christianity Today: "Mustafa Abu Sway remarked, to audible gasps from Jews in the audience, that he wished the state of Israel 'would disappear'." According to Jerusalem Jewish Voice, which calls Abu Sway "One of the most shocking and arrogant Islamic spokesmen," at that same meeting "he wished the end of the state of Israel, and [stated] that Islamic law proscribes war against any nation in dar-el-islam, land once occupied by Moslems, including Spain and Israel." Has our article prompted the good professor to clean up his act, at least when speaking in English? Nov. 6, 2003 update: A reader points to Abu Sway's much-posted article, "Towards an Islamic Jurisprudence of the Environment," an attempt to show how Islam fits twenty-first-century ideas about humans, animals, plants, land, water, and air. Of particular interest in this article is that all the authorities Abu Sway refers to – Ahmad Ibn Hanbal, Ibn Taymiyyah, Yusuf Al-Qaradawi, and Sayyid Qutub (the last of which he praises as the "renowned contemporary Muslim scholar") are either proto-Islamist or Islamist. Now, he is entitled to admire Islamists, and this is unrelated to his being an activist in a terrorist organization, but it does point to his ideological compatability with Hamas, something his admirers seek to deny. When traditional Muslims find themselves as a minority in society [in Israel or Western countries], their aspiration is to restore or establish sovereign majority status. To imagine shared sovereignty or dual sovereignty is not being faithful to Islamic tradition. (The square brackets were in the original USIP publication.) Abu Sway's wording is exquisitely polite but his meaning is also very clear: Palestinians cannot accept a state alongside Israel but must have one that replaces Israel. Although Landau goes on to spell this view out in his own words (Abu-Sway, he writes, "advocates a single state, governed in accordance with Islamic principles"), he seems unable to understand its significance, as shown by his calling this chauvinistic demand an "idealistic argument." Also of interest is Landau's slightly hysterical defense of Abu-Sway in a letter to the editor of the Connecticut Jewish Ledger in which Landau deceptively states that Abu Sway "does not endorse any nation-state, whether Jewish or Palestinian," when of course he endorses an Islamist state. generate some publicity about Abu-Sway's course. Enrollment is small and stagnant. Might instructors be able to publicize it in the remaining days of exam week? Could you put up some posters—very rapidly! -- so that students would have a chance to learn about it before they leave for the term? Is there an email list of majors to which information could be sent? Let me know what you are able to do. The dean then ends on a plaintive note: "I would hate to see the course cancelled." Jan. 27, 2004 update: The following provides documentation and added information to complement Asaf Romirowsky's and my article in the New York Sun today. Not only does our man Abu Sway teach college students but, according to his bio, he helps write textbooks for the Palestinian Authority. Specifically, the resume indicates that he co-authored the Islamic Education book for seventh graders produced by the PA's "Ministry of Education." Martyrdom: "Martyrdom is when a Muslim is killed in the path of God. ... A person who dies thus is called a 'martyr' [shahid]. ... Martyrdom for God is the hope of all those who believe in God and have trust in His promises. ... The martyr rejoices in the paradise that God has prepared for him." Duty to fight: "Clarify the Muslims' duty towards their brethren who are threatened by occupation and aggression by enemies." Jihad: "These noble verses [of the Qur'an] prove the virtue of jihad... and warn against evading a jihad in the path of God....and warn Muslims not to defy His word nor refrain from jihad." These and other passages leave no room for the imagination; the professor teaches Palestinian youth that dying "in the path of God" is something to "rejoice" in. Is this, I can't help but wonder, the education that the Fulbright program and Florida Atlantic University wish to promote? I am attending a class given by Dr. Abu Sway at LLS [Lifelong Learning Society, a division of FAU]. In this class he has said: "I don't recognize the state of Israel as a legitimate state". This is an exact quote! His views are very clear. When he says that he welcomes a Jewish presence he means a Jewish presence in an Islamic Palestine. Feb. 8, 2004 update: The memo sent out by an FAU dean (see the Dec. 9, 2003 update above) apparently salvaged Abu Sway's class by getting the faculty to recruit students for it; 21 of them appeared. But as the semester wears on, attrition has set in; the number of students has now declined to just 14. This course aims at exploring the "Political Islam" phenomenon. It will study different approaches and methodologies to understand the complex relationship between Islam and politics. Attention will be paid to the development of Islamic thought in the field of politics and subsequently the positions adopted regarding issues including the nature of state, the relationship of the west, modernity…etc. History of the Islamic reformation and the Islamic movements will be discussed with the focus on the Muslim Brotherhood. This reading list includes two Islamists and four apologists; nary a critical word of militant Islam will be found here. Mar. 23, 2004 update: In response to an article in the Florida Atlantic University Press, Beila Rabinowitz provides important new information on Abu Sway, including the fact that when asked the difference between defending one's rights and terrorism, he replied "Sometimes, there's really a play on words, and it depends on where one stands." "does not use words such as radical, extreme, etc. I don't think he perceives them that way. He sees them as a reaction to frustration and violence perpetrated on them." "asked if everyone believes the media about the Wahhabis spreading militancy and causing 'the problem.' He said they have it wrong." spoke of Dar al-Islam and Dar as-Harb as constructs not in the Qur'an and Sunna. He claimed the media only portrays these to stereotype Muslims." Again, I ask: is this the deceitful education FAU wants its students to receive? 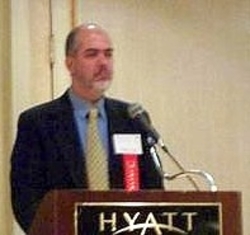 July 20, 2004 update: Scott Alexander, director of Catholic-Muslim studies at Chicago's Catholic Theological Union (CTU), came to public attention as a would-be expert witness for Fawaz Damra, ready to explain why Damra having called Jews "the sons of monkeys and pigs" really did not mean what it would seem it does. Now it turns out that Alexander hosted Abu Sway in 2002, found in him a model for Catholic-Muslim dialogue, and nutures hopes for long-term ties to him: "The visit of Professor Mustafa Abu Sway as keynote speaker made for a stimulating contribution in deliberations but also marked the beginning of a proposed institutional relationship between the CTU and Al Quds University's Islamic Research Center." This linkage shows again how Middle East specialists who apologize for Palestinian violence and militant Islam stick together. Mar. 11, 2005 update: Oh, those clever Islamists, using freedom of speech, democracy, and other liberal concepts for their violent and totalitarian ends. The Palestinian Authority is attempting to curb incitement to terrorism by Islamist imams, and so is requiring that they submit the text of their khutbas (Friday sermons) to the PA for vetting; refusal to comply will lead to prohibition from delivering sermons. There might even be texts prepared by the PA to read out. To which, our old friend Mustafa Abu Sway, now back at Al-Quds University in Jerusalem, responds that this "is an anti-democratic choice and contrary to freedom of expression." Asianews paraphrases him to the effect that "the sermons' anti-Israeli bent and the incitement to violence are just expressions of resistance. 'Here, there is occupation, and where there is occupation, there is resistance'." Feb. 1, 2006 update: In a long, winding rant on "Islamophobia: Meaning, Manifestations, Causes," Abu Sway calls me a one of the "pseudo-scholars of Islam who abuse the freedom that the First Amendment grants." Comment: Pretty preposterous, no, a Palestinian Islamist declaiming on the First Amendment, about which he has not the least understanding? Dec. 4, 2008 update: According to a lecture announcement, Abu Sway is a visiting scholar this semester at Bard College.